The adventure started in 2011 when the Australian Rules Football League opened their international tournament to women. Australian Rules Football, (aka Footy, AFL, Aussie Rules) is incredibly dynamic, extremely athletic, and unlike any sport previously known to Canada. It is a sport that draws from aspects of soccer, basketball, and ultimate frisbee combined with the contact of rugby and has a scoring system all of its own. In an attempt to grow the sport internationally, Australia began to host the International Cup (IC) in 2002 but at that point it was only a men’s competition; nine years later in 2011 a women’s division was opened and five countries including Canada were given the opportunity to compete. In the first IC the women could compete in, Team Canada finished second to the incredibly talented Irish team. This set the scene for an exceptionally competitive rivalry between the two countries. 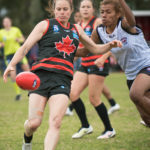 Like any good loss, IC11 left the Canadian women’s national team with a hunger to compete, learn and master the game of Australian Rules Football. As a result of these International Cups and Canada’s success at IC11, the sport began to grow. For three years the we pushed themselves and our clubs to compete at a higher level. We underwent multiple 3km running test, the much beloved beep test, skill sessions testing kicking accuracy, and theory lessons where we studied game plans and structures focused around becoming the best competitors outside of Australia. Fast forward three years to 2014. With the past IC fresh in our minds and three years of development in our back pockets, team Canada made the trip back to Australia to compete in the IC14. In this tournament, we would face the fearless countries Fiji and Tonga for the first time and, by the time The Grand Final rolled around, we were up against our rivals, Ireland. The countless fitness test and time trials, skill test and theory sessions would pay off. Through a well fought 80 minutes, Team Canada would come out victorious. After a well-deserved celebration we dispersed and made our way back home to Canada where we once again focused on growth and improvement of the sport within Canada. We went from being a part of a sport in Canada that was often confused with rugby to being a national team with fans behind us. I will now take you to Saturday, September 4th, 2016 where over 60 girls from across Canada made their way to Toronto for the long anticipated training camp where we would undergo a timed 3km run, an agility test, kicking test and mini tournament. 60 girls came with the hopes of making the IC17 national team. Following the camp those selected would undertake the task of balancing the life of an amateur athlete. These women would dedicate their hard earned money and valuable free time to train multiple times a week, undergo regular fitness and skill testing, sit through practical and tactical training, and watch whatever games were available on streamed television in order to grow our knowledge and skills of the game all the while holding down day jobs and growing families. 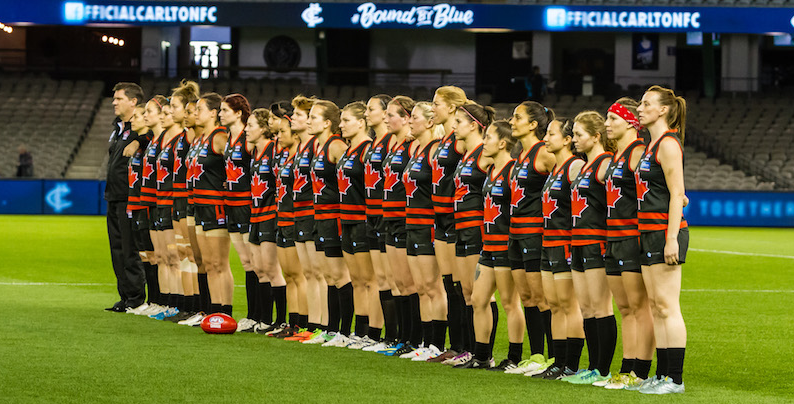 In August 2017, when Team Canada got to Melbourne this time around, Australia had just completed their first ever women’s professional league (the AFLW) where 8 teams played in front of packed stadiums full of eager fans. As a result, the atmosphere surrounding the women’s competition during the IC was much different than years before. People around the city new about team Canada and why they saw us around often asking about the outcomes of the games and school kids would come and ask for an autograph or two. We went from being a part of a sport in Canada that was often confused with rugby to being a national team with fans behind us. This IC we saw a much stronger and driven Fijian team, a highly skilled Great Britain team, and young, growing Pakistani team in our tournament pool rounds. Women from around the world were playing highly competitive footy. 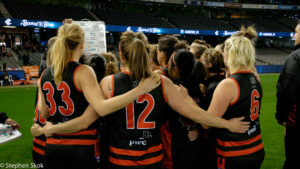 This time around the women would get to play their Grand Final at the Etihad stadium: a building that holds over 50,000 people, with a retractable roof. 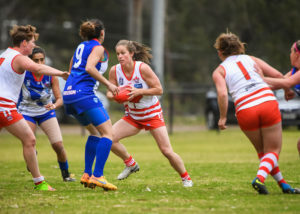 The game of women’s footy had gone from playing on small community fields (with more hard dirt than grass) to a full sized stadium field that the highest level of men’s AFL play on. No doubt we were nervous. The excitement was palpable as we followed our captain Aimee Legault onto the field carrying all of our hard work and determination along with us. Some girls had only picked up the game a couple years ago while others had played footy as their main sport for almost a decade. Our fan section was small but loud and with every kick, hit, and hand-pass they cheered us on. We started the game off well getting the first points on the board, but the Irish were determined. It was a battle of speed to see who got to the ball first, it was a battle of strength to see who could hold off the other and win the contested play, it was a battle of skill to take the mark in the air and hit our targets leading for the ball. It was a game of determination and grit to see who wouldn’t take a side step while attempting to pick up the ball and who would put their bodies on the line when the competition came barreling at us. Both teams fought hard, fast and with heart. When the buzzer went we were one kick away from taking the lead. We were one kick away from getting to hoist the cup above our heads and celebrate the first win at Etihad stadium for the women’s competition, one kick away from everything we trained for. When the buzzer went the only thing we could do was pick our teammates off the field, wipe our eyes and circle up as a team to support each other through what every athlete dreads. Defeat. Standing in that circle looking at the disappointment and hurt on my teammates faces I knew this was not the end. The buzzer signified the end of an international tournament like none we had played in previously. It was full of women from around the world with better skills and bigger hearts then we had ever seen. Our journey had ended and we were gutted to have come so close only to walk away empty handed. AFL is a game that draws from the aspects of Soccer, Basketball and Ultimate Frisbee combined with the contact of Rugby and has a scoring system all of its own. However, what we will take with us is an experience that not many athletes get in their lives. We were given the opportunity to represent our country on an international level playing a sport we love. We had the opportunity to push ourselves physically, mentally and emotional alongside 30 other determined women. We had traveled across the country with our teammates and built a family who would sacrifice everything for each other. In three years, the competition will have grown and the skill will have increased and there will be more women competing then every before. In 2020 Canada will be back to fight for that title and build with each other another family of athletes working for victory. Saturday September 4th, 2016 over 60 girls from across Canada made their way to Toronto, Ontario for the long anticipated training camp where they would run a timed 3km run, undergo an agility test, kicking test and mini tournament all with the hopes of getting to represent Canada in Melbourne Australia at the Australian Rules Football (AFL) International Cup. The International Cup is a tournament that takes place every three years. The AFL welcomes countries from around the world to play in a tournament to see what country outside of Australia is the strongest at Australia’s national sport. For those that do not know much about the sport, AFL is a game that draws from the aspects of Soccer, Basketball and Ultimate Frisbee combined with the contact of Rugby and has a scoring system all of its own. The game starts with a center bounce and from there the two teams play a highly skilled and quick paced game of contact keep away all the while moving the ball down the field by either running, kicking or hand passing the ball where a player eventually kicks the ball through two uprights to score a goal (6 points) if they miss the two middle uprights there are two more wider posts on either side that score the team 1 point. This incredibly dynamic sport has attracted players from all backgrounds of athletics. Women with a background in almost any sport are able to find a spot on the field and excel. The current national team is made up of past soccer, rugby, hockey and basketball players; there are figure skaters and dancers, swimmers and marathon runners getting the chance to represent their country. Hilary has always had a great passion for athletics. She got her first taste of competitive sport in hockey and after that was involved in as many activities as she could be throughout her schooling. In high school she was part of basketball, volleyball, track, cross-country and swimming. Swimming was her main sport form her elementary years into university where she competed for the university of Alberta. Once her swimming carrier was over she made the transition into triathlons where she trained for and competed in 2 iron man Canada triathlons. In 2011 Hilary was fully introduced to Australian Rules football and fell in love with how dynamic and diverse of a sport it was. Her athleticism and experience in a variety of sports allowed her to find success in the game quickly. She soon became a member of the Canadian national team and that summer traveled to Australia for the first ever women’s International Cup. Since then, Hilary has captained team Alberta to a national championship, was vice captain of team Canada when they won the Australian Rules International Cup in 2014 and had the privilege to lead the team once again as vice-captain in the past 2017 international cup.